Hacking Health is relaunching in Winnipeg this February! Our goal at Hacking Health Winnipeg is to have a long-term impact on the health system around us and we need your help. Healthcare professionals, designers, developers, innovators and entrepreneurs all have a part to play in building useable solutions to frontline healthcare problems that can be integrated and implemented into our healthcare system. At this relaunch café, we will be making plans for the future and hearing from our 2014 Hackathon winners LogixMD. LogixMD started as a doctor’s pitch in Winnipeg, but now is a dynamic medical software company that creates innovative knowledge translation software and web apps that transform complex medical decision-making processes into a simple and logical workflow. 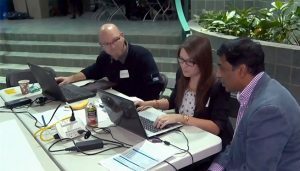 Find out how Hacking Health Winnipeg got three strangers together to collaborate and how they came up with a technological solution to an important issue in Manitoba’s healthcare system and then continued on as a dynamic medical software company. Join us as we officially relaunch this important initiative as we learn from the past and look to the future.